Peter asked me in an unofficial capacity as his past lecturer in Quantum Physics to read Qbits, a book aimed at inspiring young readers to be interested in science by combining some science facts with a fantasy world. The uncovering of the laws of quantum mechanics is arguably the most profound achievement of the human intellect. Through a deep understanding of these laws, our most imaginative and creative thinkers have produced discoveries ranging from the mundane to the marvellous, from the bizarre to utter bewilderment. But what if we take these laws and stretch them a little. Then a little more again, till they almost, but not quite, snap. Then play out the consequences in the minds and the life of two otherwise everyday Aussie chaps Tom and Scott whose real world lines cross the virtual world lines of some of our most famous scientists who come to 'life' in an other-worldly quantum mechanical reality. The result is a first-time book by Peter Fitzgerald which is a perversely delicious mixture of extreme physics, furious adventure, and improbable possibilities in an astonishingly imaginative outpouring that pushes to the limits what might happen when quantum mechanics really meets the real world. The flights of fancy of the main story are leavened with snippets of 'real' information about the world from a physicist's perspective, more than enough to make any young reader, for whom the book is intended, to start to wonder that maybe, just maybe, the world of science is a world very worthwhile exploring. Who knows where their adventures in science might take them. Perhaps to places as intriguing as where the quantum adventures of Tom and Scott have taken them now, and may take them next. James Cresser obtained a PhD in theoretical physics in 1979 from the University of Queensland. There followed a post-doctoral position at the Max Planck Institute for Quantum Optics in Garching, Germany in 1980-82, a second post-doctoral position at the University of Rochester in Rochester, New York, 1982-84. He took up a position at Macquarie University in mid-1985. Most recent work has been on non-Markovian open systems, quantum trajectory theory and thermodynamics of quantum systems. What happens when four great scientists- Galileo Galilei, Isaac Newton, Marie Curie and Albert Einstein- are reincarnated in a quantum universe and unleashed on an unsuspecting world? Tom Jackson and Scott 'Mad Dog' Maddocks are trying to lead a normal life as researchers and lecturers at the University of Sydney – drinking coffee, playing rugby and partying. But the Qbits can (and will) summon them to the Great Hall whenever they choose, to provide updates on a world-threatening situation and what the US president has said, watch a live feed from the military drone they've hijacked or just to complain about each other. Never meet your heroes, right? The goal of Qbits is to inspire at least one teenager or adult to follow a career in science, but it's also an extremely enjoyable read. First-time author Peter Fitzgerald has combined chaotic adventures, fascinating facts from Shrodinger's cat, and the hilarious Qbits to create a book that is part adventure story, part science fiction. Let's hope there is a sequel. Peter Fitzgerald’s Qbits is science and is fiction, but not a stereotypical science fiction novel. Rather, it’s an adventure tale that refers to science. Tom Jackson, a first year lecturer and research physicist at University of Sydney, dabbles in small inventions, one of them a quantum storage device worn as a ring. Tom is struck by lightning and the device becomes embedded in his body. When he awakes he discovers that he can send and receive email, talk on the phone and access any information in the world, all from inside his head. He is randomly teleported to a quantum universe through Watto, a portal key to the Great Hall where the Qbits reside. 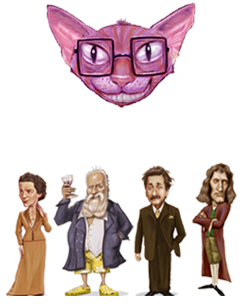 The Qbits are the modernised versions of Albert Einstein (Alby), Galileo Galilei (GG), Marie Curie (Mac) and Sir Isaac Newton (Newts). There are no boundaries in this quantum universe. GG, the rebel of the bunch, discovers that a Perseids meteorite shower will hit Norway and takes it upon himself to notify the US president, the CIA and NASA. Fitzgerald’s cast of past and present scientists takes the reader on a wild adventure. From the virtual Area 51 files to the outer regions of space, this extreme and exciting tale brings the wonderful study of science to life. Set in 2015, this novel by Peter Fitzgerald has come about as a result of Peter’s love for science and also his larrikin ways. While some of us think science is a rather dull subject, Peter particularly thrives on it and has decided to write this funny, quirky novel, based on science, for our enjoyment and pleasurable reading. It is Sydney in the year 2015 and, thank goodness, strong cappuccinos and great cafes have not been replaced with something ‘cyber’ or a ‘pill’ as yet. Much to Tom Jackson’s dismay, and just as he is beginning to enjoy his five kilometre jog around Sydney’s wharf, he is teleported from his real life to another space, a quantum space just as real as his reality. Fifteen seconds later he finds himself in the Great Hall, a medieval type-setting, meeting with the Qbits. Hanging around the table were four people who had created their own portal to any universe and they could be ‘anywhere, anytime and instantly’. Their names are GG (a scientist who fancied himself as Galileo Galilei); Mac (a reincarnation of Marie Curie); Alby (who had the DNA of the great Albert Einstein); and Newts (he had the QED of Isaac Newton). What a collection these people were, and quite frankly, they did Tom’s head in at times. Even more mysteriously their viewing screen (in the guise of The Great Tapestry) was always overseen by Wat*to (a remarkably astute feline who closely resembled Schrodinger’s cat). Watto’s feline smiling features always popped up when the unusual foursome were gleaning information from anywhere and everywhere. This remarkable team was becoming more and more random in their thoughts and actions. When Tom arrives, they are deeply intent on a live feed of a US military drone hovering around Mt Everest. What are the Qbits getting into and how will it affect poor old Tom? You’ll just have to read on won’t you? Peter Fitzgerald’s imagination and sense of humour shines through this science fiction novel that combines things we all currently love and know with bits and pieces of information and technology which may or may not be available in our future. Peter has written a genuinely entertaining story which I have really enjoyed reading. This novel is certainly an unusual sneak peek at what the future may hold in store for us.